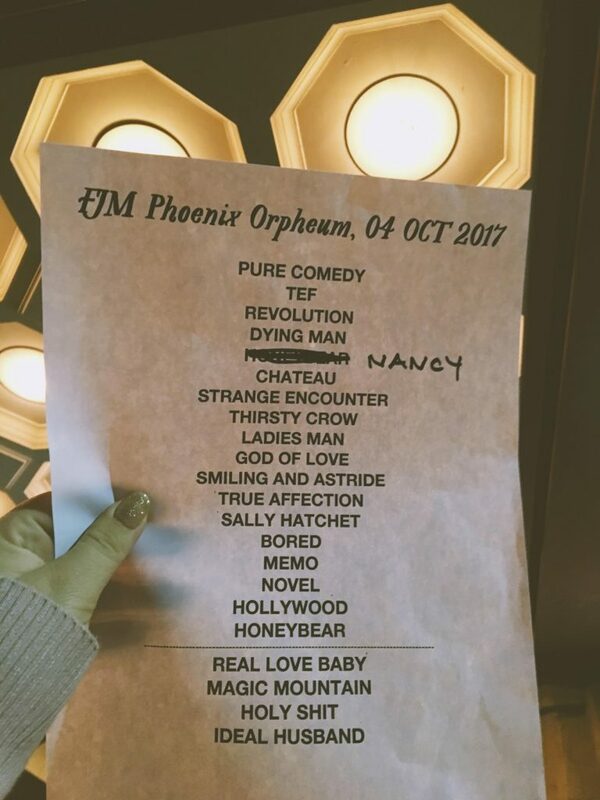 Millennial hipsters, and white middle-aged men/women alike, gathered on October 4th to see Father John Misty preform at the Orpheum. The evening opened up with Weyes Blood, a psychedelic folk rock singer Natalie Mering with her band. Mering appeared on stage in a crushed moonlight blue, velvet suit. Her voice smooth the velvet she wore, Weyes Blood’s tunes enchanted the atmosphere of the theater – despite the restlessness and chatter of the audience impatiently waiting for their main attraction. Weyes Blood was like a sitting in on a 60’s daydream, and I enjoyed every minute of it. As the openers performance came to a close, I was transported back to the chatty crowd that filled the Orpheum. A little after 9pm, an audience member shouts out something about the D-Backs winning the Wild Card game – a loud round of bro woo’s erupted from all over the theater. Flute solos played and fog dispersed throughout the theater as the crew set up for FJM – All of this setting one of the strangest tones the Orpheum may have ever housed. When the time finally comes, the lights dim, and the large white projector screen illuminates with character art from Father John Misty’s album Pure Comedy. Tillman (Father John Misty) starts off with the album title track “Pure Comedy”. There’s a raspy but pure clarity to the mixing of Tillman’s vocals and guitar – it’s impressively raw and a striking contrast to typical vocal mixing, that truly highlighted Tillman’s vocal talent. The audience whoops and woo’s throughout the entirety of the song (a common theme throughout the night), and I find myself amused and confused. Boys throughout the show scream “I love you John!”, and at one quiet point during the show, a voice (likely that of a seventeen year old girl) squealed from behind me “Daaaaadddyyy”. I cringed. I was slightly concerned, as I contemplated the possibility that a large handful of the audience members were cheering along to the very lyrics that ridicule them – I giggled to myself anyway. 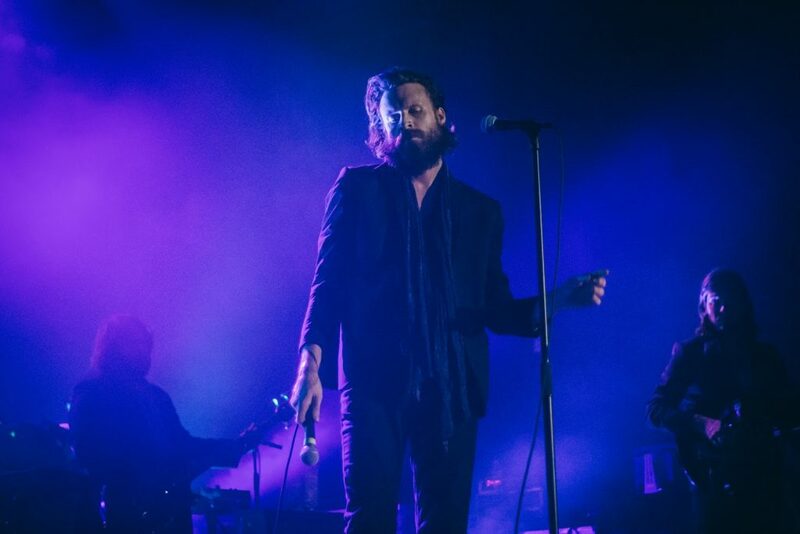 Father John Misty has been known as a spectacular performer, though this particular show seemed lack luster to his previous (at the Marquee 2015). Regardless, the show and Tillman did not fail to impress. Watching Tillman and his band play on the stage of the Orpheum was more like watching a grand production, than an indie rock concert. Halfway through the show, Tillman paid tribute to the late Tom Petty – covering “To Find a Friend”. By the end of the show, a herd of audience members (and I) stormed the orchestra pit for the encore. The Orpheum staff urged people to return to their seats unsuccessfully and allowed us all to stay till the end.